The Elimination Diet is used to help your body determine what foods you are allergic or sensitive to. This diet also allows your body to detox from the foods that have been compromising your system. The most common food culprits are dairy, gluten, corn, nightshade foods, processed meats, eggs, shellfish and citrus fruits. Being on an elimination diet takes some effort, but planning one meal at a time helps. A few good breakfast suggestions can help you to start off your morning. The most popular breakfast foods are oatmeal, toast, cereal or a combination of these. Since these foods are often the ones you have an allergy or sensitivity to, it is important to avoid them. However, there are grains that are acceptable on an elimination diet. According to the website, Functional Medicine, brown rice, quinoa, millet, amaranth, buckwheat and teff are acceptable substitutions because they do not contain gluten. All of these grains can make a warm bowl of porridge for a healthy, sustainable breakfast. To complete this meal, serve it with a non-dairy milk such as almond, rice or soy and top it with fresh berries and a handful of walnuts or almonds. Most fruits, except for citrus fruits such as oranges, limes, lemons, and grapefruits, are an acceptable choice for breakfast while on an elimination diet. 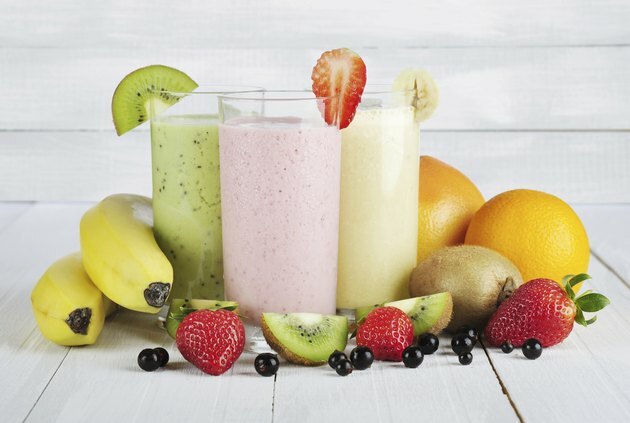 To make this a more filling breakfast, turn your favorite fruit or a combination of fruits into a smoothie by blending the fruit with your choice of almond, rice, or soy milk. It is important to not use dairy milk because many have a sensitivity or allergy to it. To add some nutritional punch to your smoothie, add flax seeds, almond butter, some vegetarian rice or hemp protein powder. Throw in some ice cubes and blend. Most commercial bread contains gluten, an ingredient that is not allowed on the elimination diet. However, there are suitable substitutions such as rice, pecan or millet bread or bread made out of tapioca flour. A great breakfast idea would be to toast a piece or two of one of these gluten-free breads and top it with two tablespoons of nut butter such as almond or cashew butter. Peanut butter is not an acceptable choice because many are allergic to peanuts and its derivatives. Add a sliced banana or some fresh raspberries and you have a complete breakfast.